China is adding carfentanil and three related synthetic opioids to its list of controlled substances effective March 1, China's National Narcotics Control Commission said Thursday. The U.S. Drug Enforcement Administration called the move a potential "game-changer" that is likely to reduce supply of key chemicals driving a surge of overdoses and deaths among unsuspecting drug users in North America. After China controlled 116 synthetic drugs in October 2015, seizures in the United States of compounds on that list plunged. "It's a substantial step in the fight against opioids here in the United States," said Russell Baer, a DEA special agent in Washington. "We're persuaded it will have a definite impact." Carfentanil is deemed to be many times more powerful than heroin. Dealers cut fentanyls into heroin and other drugs to boost profit margins. Beijing already regulates fentanyl and 18 related compounds. China said it is also placing carfentanil's less-potent cousins furanyl fentanyl, acryl fentanyl and valeryl fentanyl under control. All are prevalent in the U.S. drug supply, Baer said. 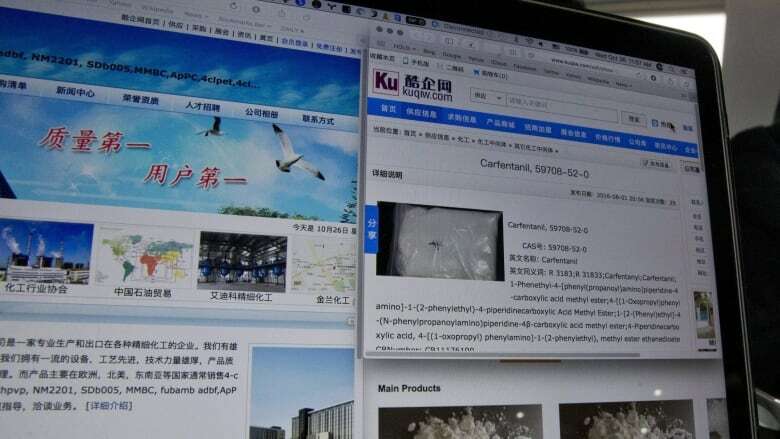 In October, The Associated Press identified 12 Chinese companies that offered to export carfentanil around the world for a few thousand dollars a kilogram (2.2. pounds), no questions asked. That same month China began evaluating whether to add carfentanil and the three other fentanyls to its list of controlled substances. Usually, the process can take nine months. This time, it took just four. Both the DEA and U.S. State Department have pressed China to make carfentanil a controlled substance. Though Beijing has said U.S. assertions that China is the top source of fentanyls lack evidence, the two countries have been deepening cooperation as the U.S. opioid epidemic intensifies. U.S. opioid demand is driving the proliferation of a new class of deadly synthetic drugs, made by nimble chemists to stay one step ahead of new rules like this one. As soon as one substance is banned, others proliferate. After Beijing tightened its focus on fentanyls late last year, the AP documented how Chinese vendors began to actively market alternative opioids, like U-47700. "We don't think their scheduling actions will end with just these four," Baer said. Looking for fentanyl: Should the government be able to open your letters?